There’s just something special about a delicious chicken salad, whether it be a traditional chicken salad recipe for lunch or something loaded for a main dish dinner or potluck side, eating healthy and low carb chicken salads makes an easy meal idea. 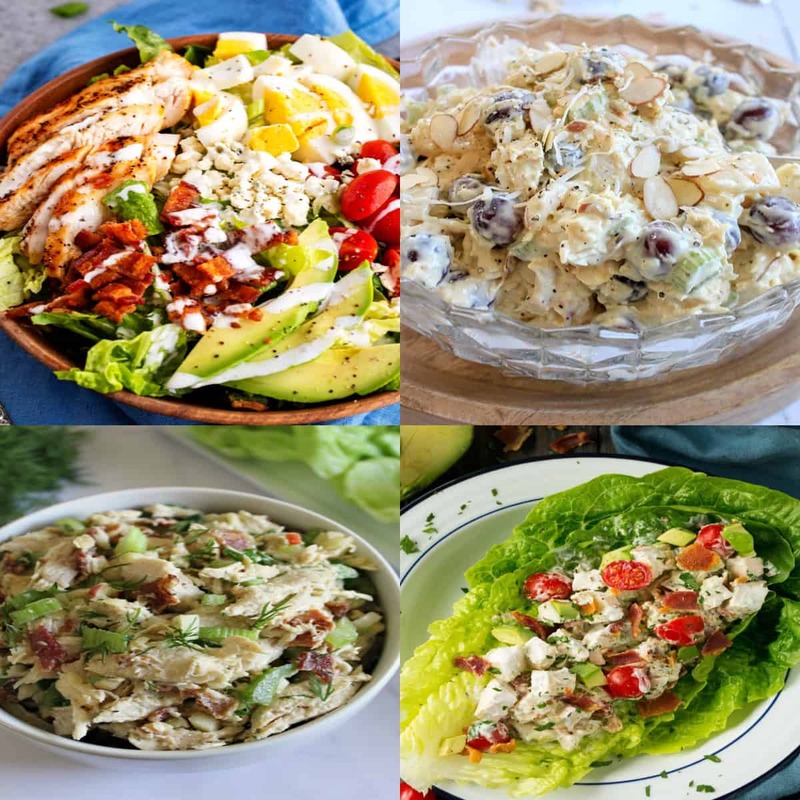 Whether you’re needing a low carb or keto chicken salad recipe to take on the go or to work, need a side dish at a BBQ, or want to serve a light and healthy summer dinner, there’s such a wide variety of chicken salads to make every day of the week. I don’t even know if it’d be possible to get tired of low carb chicken salad since the recipe ideas are endless! In our house we love to buy Costco canned chicken to whip up a quick chicken salad for lunches or to meal prep on Sundays. The cheapest way to cook chicken for making a keto chicken salad recipe is to cook a large bag of chicken tenders from frozen. And did you know it’s possible to shred chicken in only 20 seconds with this handy trick? If you’re following a keto diet, you might be wondering if low carb chicken salads can even be on your program. Most people following a keto diet stick to 20 net carbs or less per day, so as long as you’re keeping your salads filled with low carb or no carb options, than yes, chicken salad on keto is definitely an option for you. 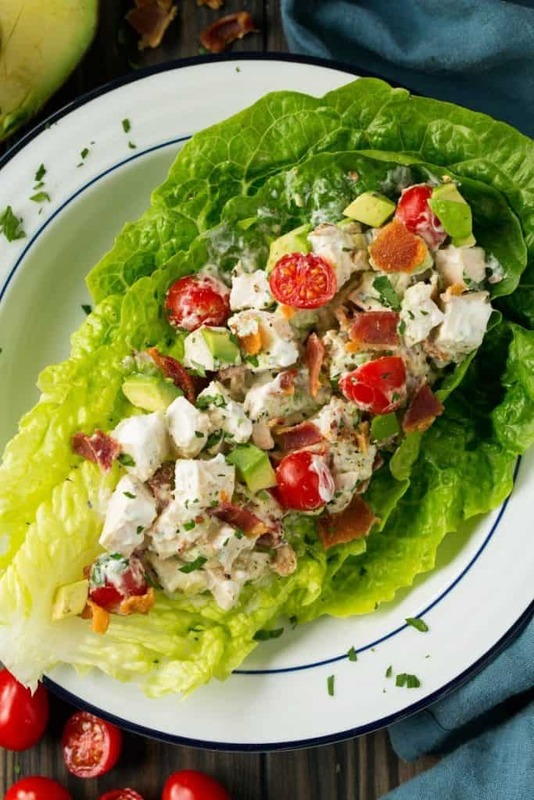 Many low carb chicken salad recipe ideas also have healthy fats like olive oil, nuts, healthier mayonnaise brands, or fat from avocado. These all work as ideal healthy fat sources when you’re going keto. Some of the recipes in this post might be considered low carb at first glance, if there’s ways to bring down the carbs and make easy swaps to turn them into a keto chicken salad recipe, the notes will be included. This is our basic go to keto and low carb chicken salad recipe we make over and over again at our house. It’s so simple and versatile! Adding in some no carb extras would be another great way to add variety to the classic chicken salad. 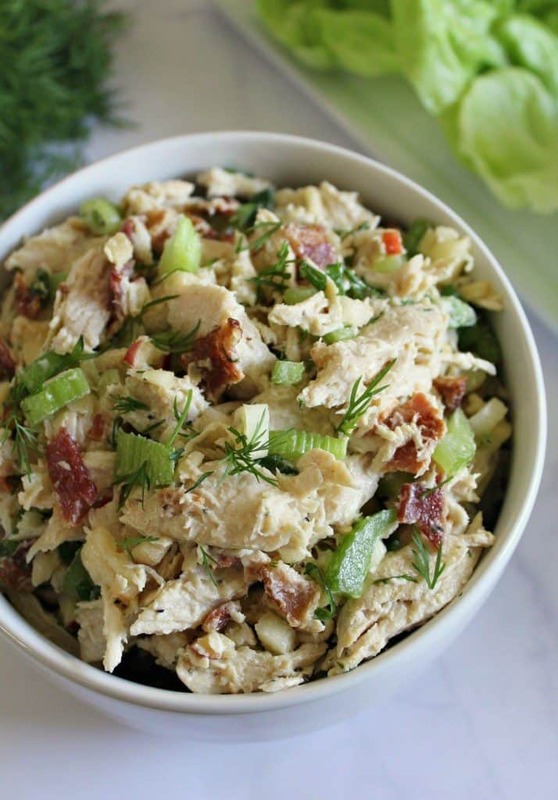 The sky’s the limit with this easy low carb chicken salad with canned chicken. We’ve also rounded up 10 of the most delicious low carb and keto chicken salad recipe ideas out there! We found one for each day of the week, so if you’re obsessed with healthy chicken salads like we are, you have lots of lunchtime options. 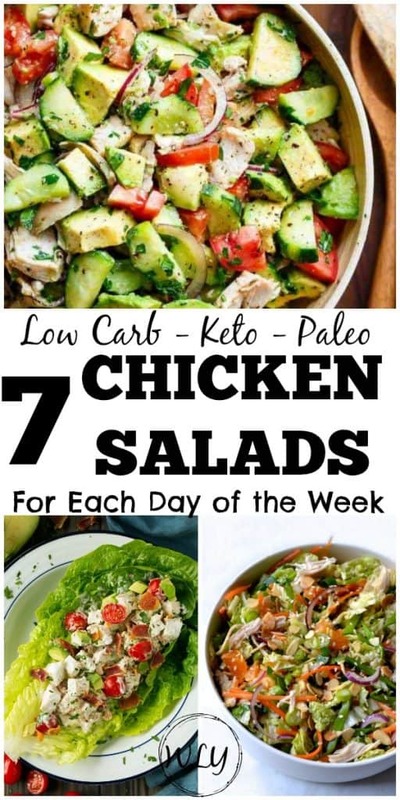 Most of these recipes are lower carb and some are paleo, a couple also work if you’re looking for easy keto chicken salad recipes with a couple adaptions. A Greek inspired delicious salad that comes together so fast with pre-cooked chicken. With such a perfect blend of flavors, the dressing is super simple so you can focus on the fresh flavors. Only 5 net carbs per serving! While the recipe uses a rotisserie chicken, our favorite way to pre-cook chicken is actually in our instant pot. But this would also make a wonderful low carb grilled chicken salad too since it’s close to summer time. 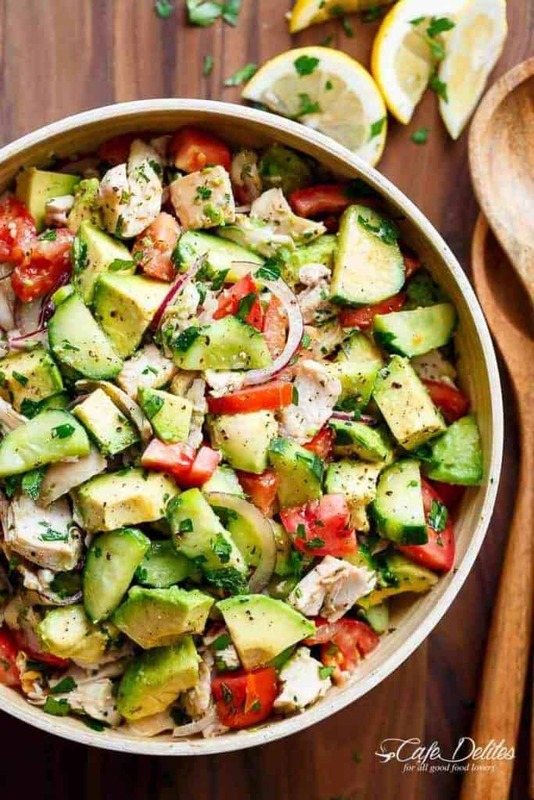 This is another salad where you could cut back on tomatoes (or even cucumbers) to reduce the carbs and increase the chicken, avocado and cheese, but with just 5 net carbs per serving, I’d recommend making the low carb chicken salad recipe as is. This is the perfect salad when you’re on the go because you can just roll it up and it makes a fantastic keto chicken salad wrap. It’s a fancier version of a keto chicken blt salad since it dresses it up with avocado and other goodness. BLTA stands for bacon-lettuce-tomato-avocado, just mix in shredded chicken for your protein and you have a delicious keto lunch to take to work on when you’re on the go! Even with a small bit of tomatoes, this keto chicken salad recipe is still only 3 net carbs per serving! Heather’s delicious recipe is lower carb and has the perfect blend of sweet and spice. If you’re following a keto diet instead of low carb, you can simply take out the apple or substitute with something else. 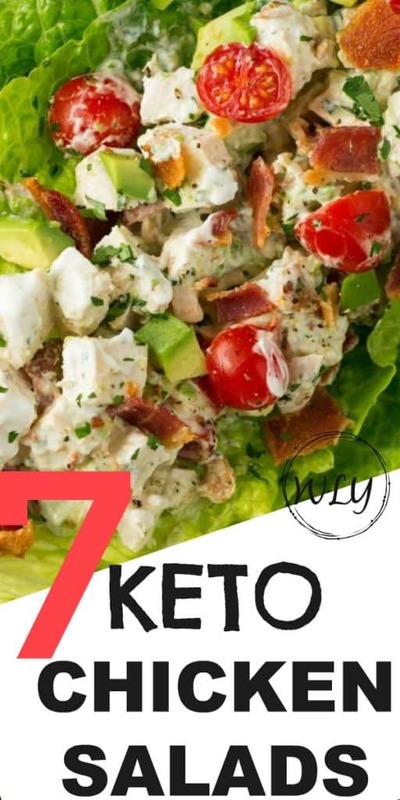 The low carb keto chicken salad with bacon serves 6. The recipe calls for 1/2 of an apple, which has 21 net carbs, and means that if you take out the apple you’d save 3.5 net carbs per serving. You could definitely could completely take out the apple and make a substitution with increased celery, pickles, eggs, avocados or nuts. What’s your favorite low carb or keto chicken salad recipe? Mine hands down, is a low carb cobb salad with chicken. This is the same salad I’ll usually order when we go out to eat dinner too. 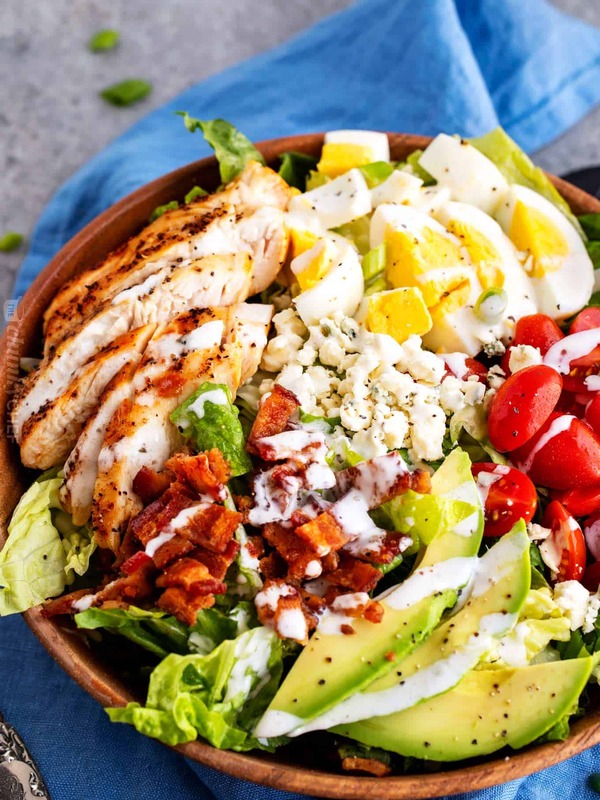 At only 6 net carbs per serving and chock full of savory ingredients, keto cobb salad makes for an ideal lunch or dinner recipe. While Amanda does give you a recipe for a low carb Ranch to go with the salad, I admit we’ve been lazy at making our own keto salad dressings after discovering this store bought paleo and keto Ranch dressing brand. 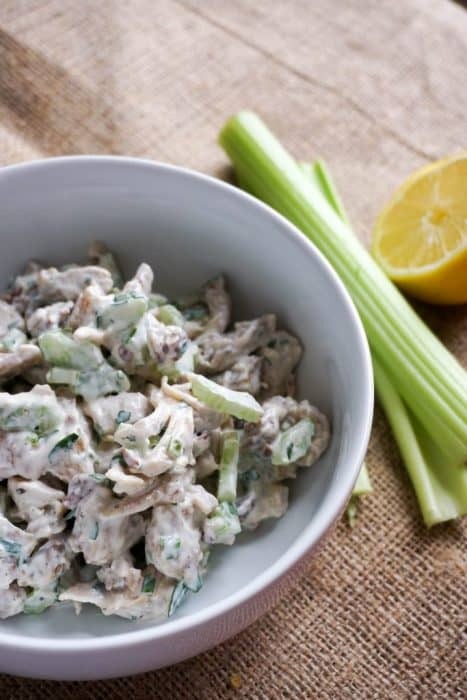 If you’re craving a more traditional creamy chicken salad, then you’ll love this recipe by Ketoconnect.net! The secret ingredient to the dressing is actually sour cream, which is a nice change from the standard mayo. Yum! 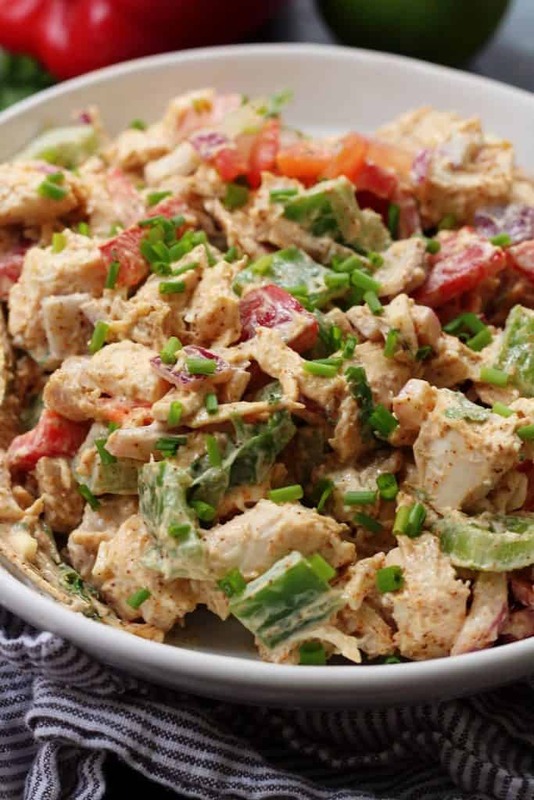 This keto chicken salad with pecans is a flavorful twist on a classic recipe. Only 2 net carbs per serving. 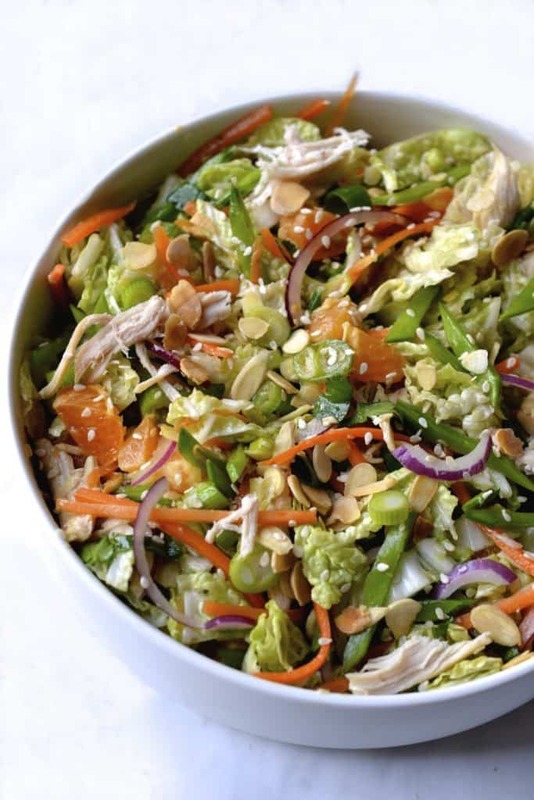 This lower carb Chinese chicken salad gets on the table fast if you use pre-cooked chicken! While this does have 1 T of honey in the dressing, chef Carmen says that’s an easy ingredient to leave out or to substitute with your favorite low carb sweetener. My favorite keto and low carb sweetener is monk fruit, this golden version would be a perfect replacement for the honey. I’ve swapped it for honey before my softening a little butter on the stove, adding the monk fruit and then simmering until the crystalized monk fruit dissolves. So yummy! Can you ever really tire of taco variations? Making a simple low carb taco salad has been one of our favorite ways to still enjoy taco flavors yet skipping the high carb tortilla. This version is paleo too and instead of adding cheese, it’s served with a side of avocado. Bailey adds a wide variety of interesting flavors to her low carb chicken salad recipe, with only 10 net carbs this is a great salad to meal prep and eat multiple days- it serves 6!. If you want to bring the carbs down a little, you can skip the tomatoes. If 10 net carbs seems a little high to you, what’s been working for my husband is to save 10 net carbs for 2 meals each and then he has one zero net carb meal and snacks. 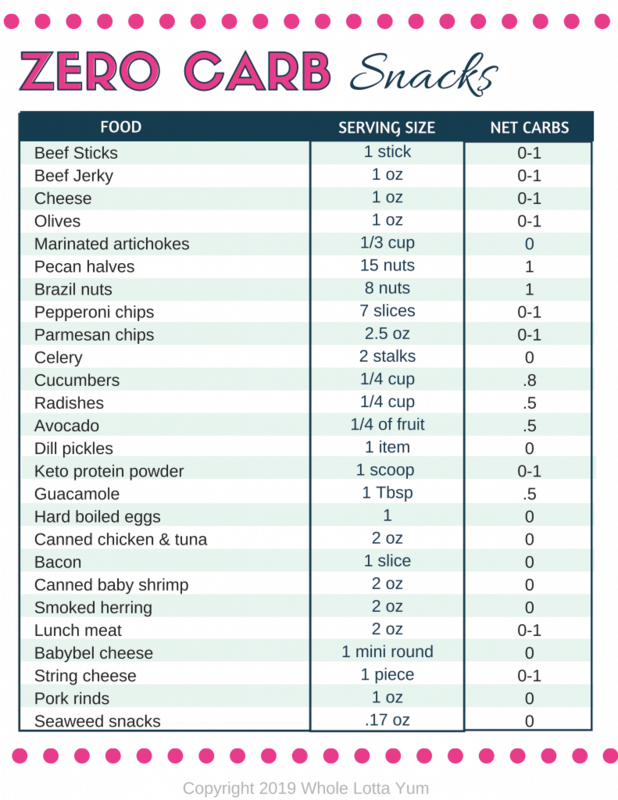 Be sure to download our free printable for the full no carb snack list! Many of the ideas make simple lunches too. This low carb or keto chicken taco salad looks so delicious, you surely won’t miss the tortillas or side of chips. Who knew you could still have low carb chicken salad with grapes when you’re following a low carb or keto diet? But you can! You’ll love this healthy version from my sister’s blog, that only has 7.8 net carbs per serving. The key to keeping the carb count down for traditional recipes that have higher carb items is to just use less of them, and then beef up on the no carb or low carb ingredients. 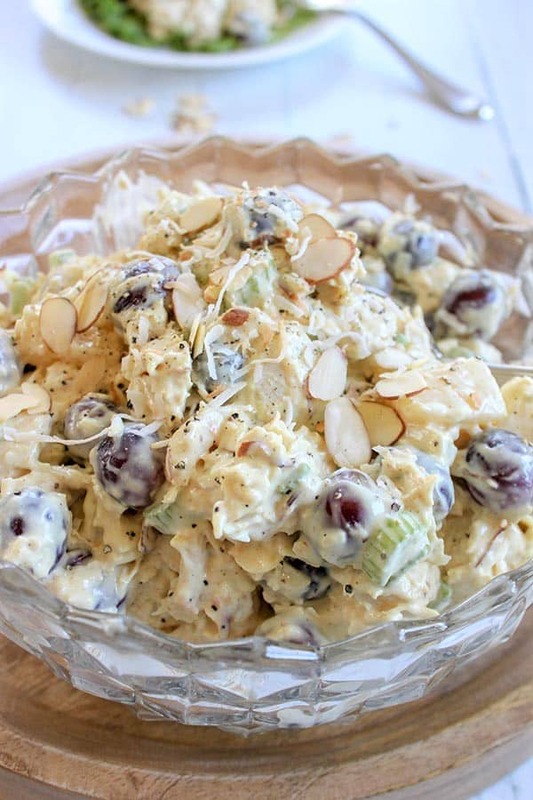 Low carb chicken salad with grapes makes the perfect spring or summer time meal. 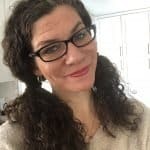 And how could we have a keto and low carb chicken salad recipe list without including a low carb chicken caesar salad?! The list just wouldn’t be complete. 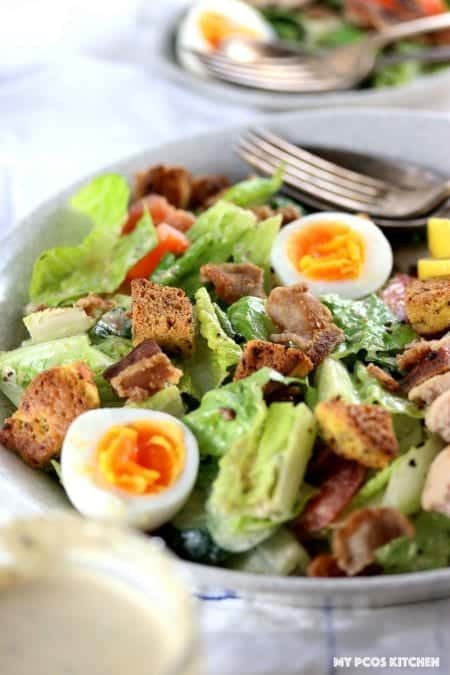 You might be surprised to see keto friendly and gluten free croutons on the salad, but using a keto quick bread, you can make your own crunchy and healthy croutons in less than 2o minutes. While you of course can make your own caesar dressing at home, we’ve been loving this store bought keto paleo caesar dressing made with avocado oil!